The Basilica of Santa Maria Novella of Florence has been for centuries the reference point of the religious order of Dominicans and it is one of the most important monumental complexes in Florentine scene. 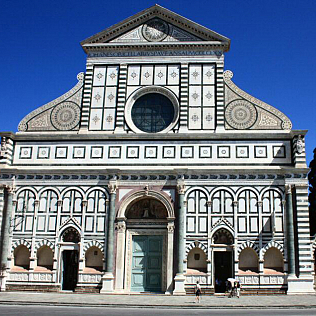 Visit the Church and the environments of the Museum of Santa Maria Novella, where art and spirituality merged together. The church is composed by many chapels decorated with frescoes by Domenico Ghirlandaio, Filippino Lippi, Paolo Uccello and many others. The amazing Stories of the Genesis are painted on the walls of the Green Cloister, the Cloister of the Dead, so called for his ancient cemetery function; the Spanish Chapel is famous for its intact frescoes by Andrea di Bonaiuto; you\'ll find also the Last Supper by Alessandro Allori inside the Refectory, and the Chapel of the Florentine Ubriachi family. The complex preserves important masterpieces like the two Crucifixes of Giotto and Brunelleschi, and the Masaccio\'s Holy Trinity. The original church was situated outside the city walls, it was called indeed Santa Maria tra le Vigne (\"between vineyards\"). Consecrated in 1094, you can still admire some remains of the ancient building under the current sacristy.